BBS, Inc. Employee Earns Leader’s Circle Director Award! BBS, Inc. Boston is proud to announce that one of their employees has earned the prestigious Leader’s Circle Director Award for the month of May! WOBURN, Mass. - June 26, 2013 - PRLog -- BBS, Inc. Boston, a sales and marketing company in Woburn MA, has announced their recognition in a sales quality based competition among all of its employees. Each company within the entire New England program participated in the competition for the Leader’s Circle Director Award! The Leader’s Circle Director Award is presented to the sales agent with the highest total units sold with the lowest cancels for an entire month. BBS, Inc. is thrilled to have one of their employees win the award for the second month in a row! 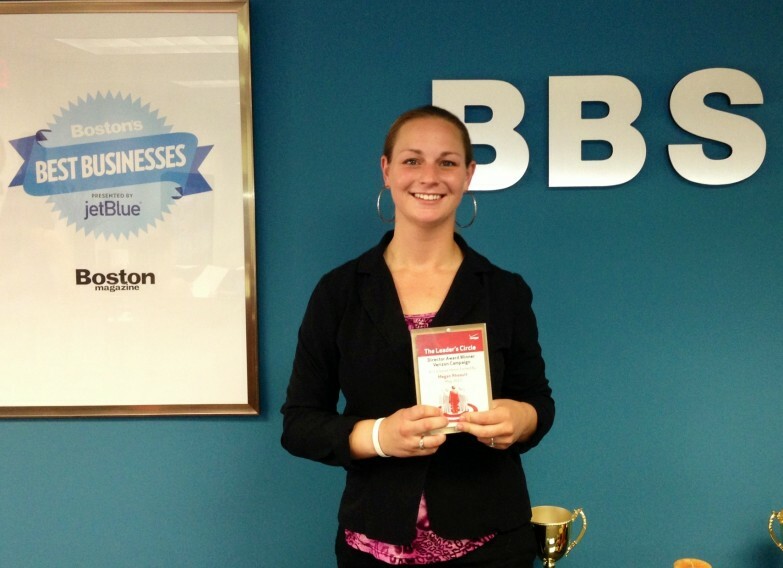 This respected award was presented to Megan Rheault, the BBS Sales Agent that exhibited the highest sales quality within the entire New England program for the month of May. Aside from receiving recognition and praise from her peers and Managers, Megan was also the recipient of a plaque and lunch with her respective Verizon Executive Manager! Congratulations to Megan, and good luck in next month’s competition!